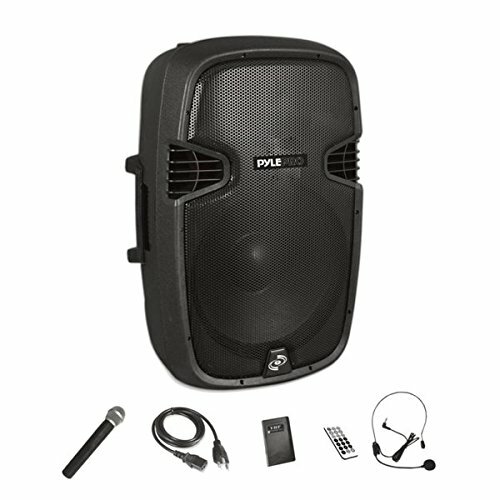 The Pyle Bluetooth PA Speaker System is a high-powered, wide-coverage loudspeaker that covers the entire audio spectrum! Built-in Bluetooth music streaming ability and rechargeable battery allow for wireless performance & quick sound setup in any location -- indoors or out. Take control of the crowd with powerful full-ranged, distortion-free sound to transmit all of your audio frequencies from deep pounding bass, to rich & chirpy high-ends. The PA speaker system contains a 12’’ -inch subwoofer and 1’’ -inch tweeter compression driver with titanium diaphragm for solid sound performance. It’s all housed in the reinforced heavy-duty molded cabinet with protective metal grill for rugged audio on-the-go. The loudspeaker comes loaded with additional audio connectivity features including RCA Stereo Input/Output Connectors, USB Flash & SD Memory Card Readers for MP3 Digital Audio Playback, (2) 1/4’’ Microphone Jacks, Rear Panel Audio Configuration Control Center, along with FM Radio. Included wireless handheld microphone and beltpack transmitter make the system perfect for mobility -- including crowd control, karaoke sessions and on-stage performances. Add portable, powerful and high-powered audio streaming ability with the Pyle Active-Powered Loudspeaker Bluetooth System.